The equality4men campaign is marking International Men’s Day (Tuesday 19th November) by officially launching our new book “Equality For Men” by Glen Poole. 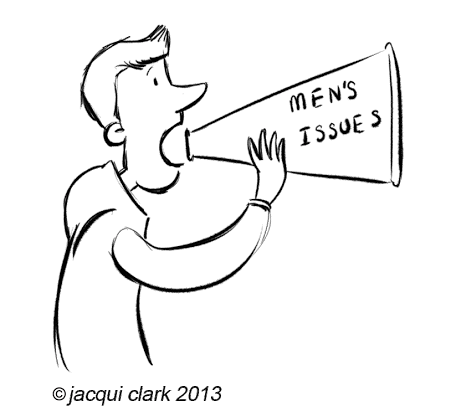 Glen , who will be launching the book in Brighton where he lives, say that “Equality For Men”offers a whistle-stop tour of men’s issues and covers topics like men’s health, male suicide, fathers’ rights, boys’ education and violence against men and boys. Glen, who has recently returned from a short speaking tour of Australia, says he has chosen International Men’s Day to launch the book because he wants it to become a bestseller that makes a global impact. Glen will be delivering a talk about Equality For Men at the Brighthelm Centre at 7pm on Tuesday 19th November and signing copies of the book which has be illustrated by Hove-based artist Jacqui Clark. This entry was posted on November 15, 2013 by equality4menuk in News and tagged book launch, Glen Poole.